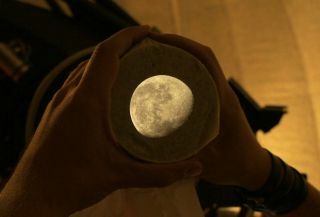 Skywatchers shoot this remarkable image of Earth’s gibbous moon captured in the hands of an observer holding tissue paper in Casa del Romano, Italy, August 18, 2011. Skywatchers Martin Dietzel and Mario Sämisch are responsible for this remarkable image of Earth’s gibbous moon captured in the hands of an observer holding tissue paper in Casa del Romano, Italy, August 18, 2011. “Seeing this image in real life, I was absolutely amazed by the projection of the moon onto a simple tissue that I had in my pocket," Dietzel said. A gibbous moon refers to the phase of the moon when the size of the illuminated portion is greater than half the circle, but not yet a full moon. The Earth's lone satellite is seen here projected through the lens of an 80 cm (31.5 inch), f/8 telescope onto a piece of tissue paper, instead of an eyepiece. The legendary 17th century Italian scientist Galileo Galilei was the first to use a telescope to make scientific observations of the moon, describing a rough, mountainous surface in 1609 that was quite different from the popular beliefs of his day that the moon was smooth. This interesting projection allows many observers, rather than just a single viewer, to see the image coming out of the telescope. It also demonstrates the real field of view of a telescope, which is larger than what an eyepiece can show. "Before, we were watching the moon through that telescope, but only one at a time. So I had the idea to use the 'old fashioned' projection style (and non-digital way) in order to explain the name of the craters and mare more easily," Dietzel said.